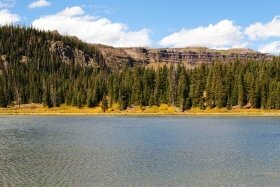 If you're planning a trip to Steamboat, then I recommend you try out some of these Steamboat Springs hiking trails. 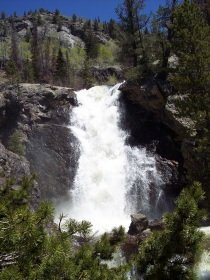 The first best place to go is Fish Creek Falls which I consider one of the top waterfalls in Colorado. 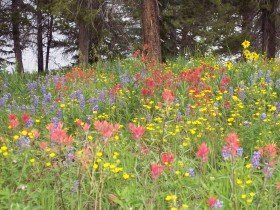 The next best place to hike is the trail to Rabbit Ears Peak; the wildflower displays are outstanding if you can catch them at the right time. 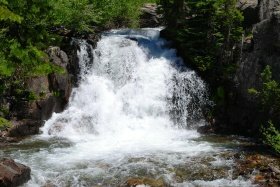 So, are you interested in visiting Fish Creek Falls? If so, then head on over to my Colorado waterfalls page. Once there, scroll part way down the page until you see the description for Fish Creek Falls. You'll see the picture of the falls plus directions on how to get there. Restroom facilities-no, but there is nearby at the Dumont Lake picnic area. Elevation-10,654 feet at the peak. Directions to Rabbit Ears Peak trail: from Denver, follow I-70 west to the Silverthorne exit 205. (Sign also says Steamboat Springs.) Turn right, (north), on Colorado Highway 9 to Kremmling. In Kremmling, turn left on U.S. 40 west and follow it to Rabbit Ears Pass. Once you start climbing Rabbit Ears Pass, be looking on your right for the Muddy Creek and Buffalo Park turn-off signs. When you pass these signs, you'll be almost there, (within about 1 mile), so you need to watch carefully on your right for the small sign that says Dumont Lake. 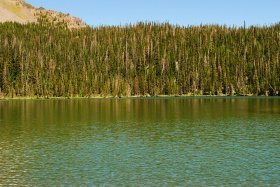 Turn right at the Dumont Lake sign and proceed on National Forest Road 315. Follow this road for about 1.5 miles until you come to the old stone monument on your left. Turn left at the monument and into the parking area. The trailhead for Rabbit Ears Peak is not well marked so here's what you need to do: when you're ready to do this Steamboat Springs hiking trail, go straight on the main dirt road that you will see, (not the left or right trails), and continue along it. In a few short minutes, you'll see a small marker on your right with the number 291. This is where you start your hike to Rabbit Ears Peak. So, as I already mentioned, this is a really good wildflower hike if you can catch the flowers at the right time. That's usually sometime around late July. The very best wildflower displays are actually around Dumont Lake and the picnic area. But the wildflowers in the meadows along parts of the trail are pretty nice too. This particular Steamboat Springs hiking trail is actually an old jeep road. And you might even see a jeep or other similar vehicle, like we did. But it's not common. The dirt road starts out pretty gently before developing a moderate incline. Along the way, you'll see the wildflowers in various places and of course, you'll have nice views of the Rabbit Ears, before they disappear from sight. Most of the trail is open, (as opposed to forested), so it's a good idea to use your sunscreen. Another good idea is to have lots of water. Eventually, you'll reach a spot that's approximately the 3/4 mark of the hike, and this is where the trail gets very steep. Take your time and follow the trail to the top. Once there, enjoy the panoramic views all around you! Elevation-9000 feet at the falls. Directions to Upper Fish Creek Falls trailhead: from Denver, follow I-70 west to the Silverthorne exit 205. (Sign also says Steamboat Springs.) Turn right, (north), on Colorado Highway 9 to Kremmling. In Kremmling, turn left on U.S. 40 west and follow it over Rabbit Ears Pass and down into Steamboat Springs. In Steamboat Springs, keep following U.S. 40 west, (Lincoln Ave.), until you see 3rd Street. Turn right on 3rd Street, then turn right again on Fish Creek Falls Road. Follow Fish Creek Falls Road for about 3 miles to the pay station. There is both an upper and a lower parking lot, so after paying the fee, go to the upper lot and see if there's a spot. If not, then drive back down to the lower lot. From there, you can walk back up to the upper lot on the path next to the road. So, when you're ready, just follow the main trail that goes down, (yes, it goes down), the short distance to Fish Creek Falls. Admire the falls as you cross the scenic bridge over Fish Creek, then prepare to start going uphill. This is a Steamboat Springs hiking trail that requires some work on your part, but I think it's definitely worth the effort. Even though this trail is fairly steep, the nice thing about it is that much of the trail is forested. So you're usually in, or near the shade. In about 30 minutes, (from the bridge over Fish Creek), you'll reach a good-sized aspen forest which would be great for fall color hiking. Take a break if you want to, then keep heading up this steep Steamboat Springs hiking trail. After maybe an hour into your hike, you'll reach a smaller bridge that crosses the creek. From that point, it's only about a half hour to Upper Fish Creek Falls. The trail becomes more open, and you'll soon come to a rocky section that can be a little tricky. Just be careful, and before long, you'll hear the roar of the upper falls. Once there, you can cool off in the spray that comes off this wonderful waterfall, and my guess is that you'll think this was one Steamboat Springs hiking trail that was worth doing. We were here in mid June, and that's probably the best time to see it in terms of volume of water. The parking area at the trailhead is relatively small but if it’s full, you can park on the side of the road. And by the way, the road to this trailhead is a good dirt road, so a regular car can easily get there. Anyway, the trail to Little Causeway Lake starts just beyond the parking area. Keep the Stillwater Reservoir on your left and you’ll be going the correct way. In less than a mile, you’ll reach a fork in the trail and at this point, you want to go right, on the East Fork trail. By the way, some Steamboat Springs hiking trails are great for wildflowers and this is one of those. So keep that in mind if you like them. We did this hike in early August and some of the flowers seemed to be past peak bloom. So I’m guessing that the second two weeks in July would be a good time to see them. Anyway, the trail climbs steadily through meadows and forested areas and before you know it, you’ll see the lake off to your left. Just follow the short side trail leading down to the water’s edge. I almost forgot to mention one thing you’ll see on this hike that you won’t see on most other Steamboat Springs hiking trails, and that is the Devil’s Causeway. It’s a narrow bridge of rock on top of the towering Chinese Wall, and it’s a place you don’t want to go to if you have a fear of heights. You can see part of it in my above picture of Little Causeway Lake. Directions to the Gold Creek Waterfall trailhead: drive west out of Steamboat Springs on Hwy. 40 for about 2 miles and turn right on Elk River Road, which is also County Road 129. Follow CR 129 for about 18 miles to Seedhouse Road, (which is also CR 64), and turn right. (At this turn-off, there is also a sign saying: Slavonia.) Anyway, follow CR 64 to the end of the road and the trailhead. The road turns to dirt but it’s a mostly good road except for parts of it that are like a wash-board. At the trailhead, there is no sign for the Gold Creek waterfall. But there is a sign that says “Gold Creek Lake trail no.1150” among other things, and that’s the one you want to follow. Shortly after you start your hike on this Steamboat Springs hiking trail, you’ll come to a trail junction. You want to take the right fork and follow trail #1150. 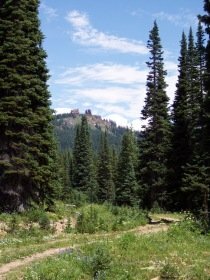 You’ll be hiking through a level area of meadows and aspen trees, and before long, you’ll cross a creek on a small bridge. In addition to the creek, you will also be crossing several little creeklets along the way to the falls. Many parts of this Steamboat Springs hiking trail are green and lush, and there are also lots of wildflowers along and near the trail. After about one mile into your hike, the trail starts to climb gradually. Continue hiking through the woods and when you get close enough, you’ll start to hear the roar of the waterfall. Continue along this Steamboat Springs hiking trail and in a short time, you’ll see a side trail on your right. Follow it down to the large flat boulder that overlooks the falls. It’s a great spot for a picnic :-). 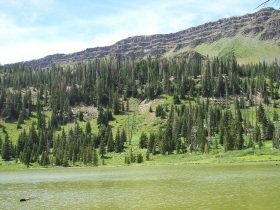 Directions to Smith Lake trailhead: from Steamboat Springs, drive east on U.S. 40 towards Rabbit Ears Pass until you see Hwy. 131 on you right. Turn right onto Hwy. 131 and drive about 25 miles to the town of Yampa, staying right on Main Street as you approach the town. Drive through town, and when you reach the Antler’s Inn, turn right onto CO 7. (This eventually becomes F.S. 900.) Go for about 15 miles until you see the Horseshoe Campground on your right. The trailhead is just beyond this campground, on your right, and you’ll see the sign for Smith Lake trail #1194. This Steamboat Springs hiking trail can be buggy and it was when we hiked it, (especially near the second pond that you’ll see on your way), so have the bug spray handy for this one. Though this hike is short, it’s scenic. And if you’re here in July, so much the better since the trail is excellent for wildflowers. In fact, there were some wonderful bunches of columbine flowers right at the trailhead when we did this Steamboat Springs hiking trail. Anyway, start walking up the fairly steep trail and in a short while, you’ll pass a pond that’s below you on your left. Continue along the trail and before long, you’ll pass another pond that’s below you and on your right. Keep working your way up this Steamboat Springs hiking trail and soon, you’ll reach the outflow of the lake on your right. From this point, you’re almost there and you’ll reach Smith Lake at the head of the valley. If you’re interested, there’s also a trail that goes around the lake. Directions to Mosquito Lake trailhead: please follow the directions, (above), to the Smith Lake trailhead until you reach the Horseshoe Campground, on your right. From that point, just follow the road to the end of the road at Stillwater Reservoir. You’ll know you’re there when the road ends. This Steamboat Springs hiking trail to Mosquito Lake starts at the west end of the parking area, and you want to go straight ahead, keeping the Stillwater Reservoir on your left. Shortly after starting out on the trail, you’ll come to a split in the trail with nothing telling you where to go. In this case, you can take either one since they both meet up with the main trail a little further up. Keep following this Steamboat Springs hiking trail up through the trees until you reach the trail register. After filling in your information, and just beyond the trail register, follow the left fork at the sign that says “Bear River Trail #1120.” The trail is fairly easy and ranges from going up to down but never really gets steep either way. For the most part, this Steamboat Springs hiking trail takes you through open meadows although you’ll see plenty of pine trees along the way. As you hike along this trail, you will come to three creek crossings, all of which have a log across them to help you reach the other side. At one point, there is also a log across the path that you have to step over. After that, it’s only a short ways to the lake. Have fun, and if you brought sandwiches, this would be a good time to eat them :-). I'm planning to do more Steamboat Springs hiking trails this summer, and when I do, I'll take more pictures and bring back some new trail descriptions. Return from Steamboat Springs Hiking Trails to Steamboat Springs page. Return to Colorado Hiking Vacations home page. This site was last updated on March 28, 2019.